Choosing the right featured image for your blog post can be challenging. You've spent hours writing an insightful piece of content. Now you naturally want a header image that will do it justice. Maybe you're tired of overdone stock photos, or you want some fresh inspiration. Whatever your motivation, this article will help you on your way with five ways to find a better featured image for your content. It’s commonly known that our brains process visuals up to 60,000 times faster than text. As consequence, your readers will absorb your featured image before they’ve even finished reading your blog title. They’re already forming an opinion of your content based on that single image. You need to make sure that it sets the ground for the post itself. To that end, you should choose an image that really captures the essence of your article. Ultimately this will depend on what you’re writing about. But consider the general topic and think about it. For example, if you’re writing about how to create the perfect social media post, an image that includes icons of different social sites is enough to point your reader into the right general direction. It’s also worth trying to select images that convey positive feelings to your reader. For example, a blog about how to create an editorial calendar that has a featured image of a stressed-looking woman sitting at a desk might work on one level. But it might also elicit similar feelings in your reader, feelings which they may then associate with your post. 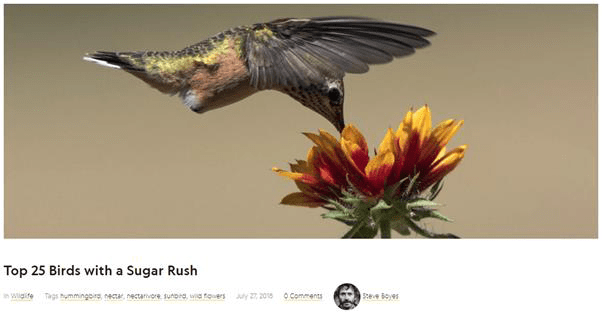 Your featured image won’t just appear on your blog post. It’ll appear in your social media marketing across Facebook, Twitter, and Pinterest, as well as your email newsletter campaigns too. As a result, it will change in shape and size as it’s viewed across different channels, and even different devices. This means that you need to choose a high-resolution image that is responsive enough to scale across your various marketing channels. But choosing a high-resolution photo doesn’t just offer practical benefits — it also conveys a sense of professionalism in your content that your readers will pay attention to. JPEGs are perhaps the most versatile image format. By using photo editing software they can be converted into almost any other format. It might require a little legwork. But if the end result is a high-resolution, high-quality image for your blog post, then it’s well worth it. It’s an arresting image, one that grabs the reader’s attention immediately, and yet it doesn’t distract from the content itself. The reader instantly knows what to expect from the post, creating a seamless content experience with their blog that doesn’t jar. By choosing a simple, tidy image for your blog, it becomes easier for your audience to get a feel for what your post is about. It grabs their attention and encourages them to read on, which is exactly what a featured image should do. And the same goes for your graphics as well. While a custom-designed graphic works perfectly well as a featured image (particularly in the marketing world) it’s important not to go overboard with it. It can be tempting to create a dazzling graphic that blows the reader away but, at the end of the day, less is always more. Bad stock photos have become so clichéd that they’ve become part of internet culture, regularly parodied in a number of memes online. From business people using megaphones to old people using computers, there’s a cringy stock photo for every occasion. They exude tackiness from every pixel, and yet businesses still pay to use the stock photo sites that provide them. When you’re searching for your featured image, don’t go down the well-trodden path of tacky stock imagery. Avoid the clichés and use a free photos site that crowdsources their content rather than commissioning it. In doing so, you get access to a huge range of high-quality photos taken by freelance photographers from all over the world. These sites frequently offer a dizzyingly diverse array of photography that ditches the overdone stock photo trope. If you’re browsing the free stock photo sites mentioned above and you think you could do better, then go for it! Decent and affordable cameras can be found in most good second-hand shops or online. And even the latest smartphones often come with sophisticated cameras that can take high-quality photos. There’s also a huge range of resources readily available online that can teach you how to take good photos. With a little practice, you could be taking professional-level photos in a matter of weeks. These provide you with a limitless supply of original photography for your featured image. You can take your DIY photos even further by using a photo editing tool such as Photoshop. This allows you to add text overlays, graphics, and more to your images. Using free training resources online, in time you can create customized images your readers won’t find anywhere else on the web. 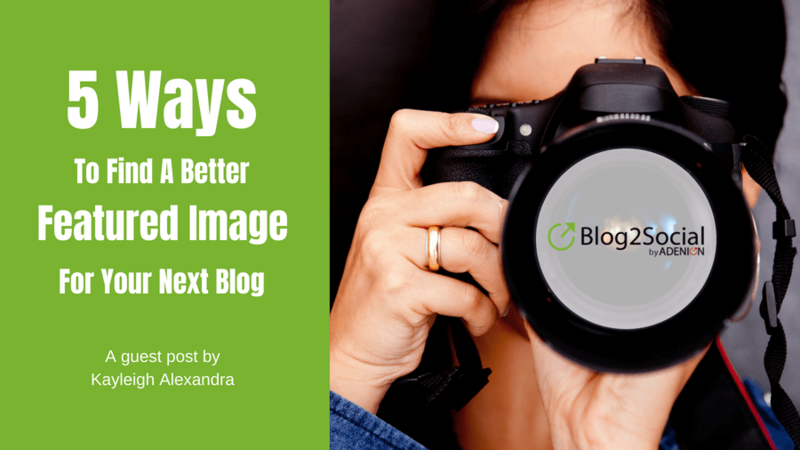 Your featured image is an important part of your blog. It’s the welcome mat to your content home, and when done right it can actually increase click-throughs to your post. Whether you’re going DIY with your images or you’re heading to crowdsourced photography sites, you can be safe in the knowledge that your next featured image will really dazzle.